Japan’s June numbers were driven largely by inbound tourism from other parts of Asia, including Chinese attracted by eased visa requirements. The number of foreign visitors to Japan in June totaled 686,600, up 1.4 percent from June 2010 and surpassing for the first time the level for the same month from before the Great East Japan Earthquake in March of 2011, according to the latest statistics. The June figure rebounded 58.6 percent from the same month last year, according to preliminary figures released by the Japan National Tourism Organization on Friday. By country or region, the number of visitors from China, Thailand, Indonesia, Malaysia and Vietnam hit record highs for the month. More people from Asian nations are traveling abroad, which has contributed to the higher number of foreign visitors despite the lingering effects of the crisis at the Fukushima No. 1 nuclear power plant. 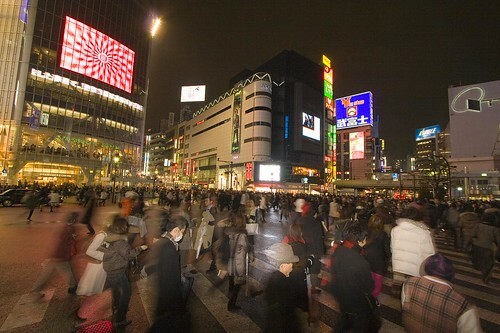 Shibuya crossing in Tokyo. Photo by Chris & Kylie. As more large cruise ships from China are docking in Japan, the number of Chinese tourists surged to 129,600, up 25 percent from June 2010. From September last year, the Japanese government relaxed sightseeing visa regulations for individual Chinese travelers. The move is believed to have driven the latest growth in the figure, which is 2.1 times greater than the same month last year. Boosted by promotions to encourage Japan travel, the number of visitors from Thailand rose to 13,600, up 36.5 percent from June 2010. However, JNTO data also shows the number of South Korean visitors was down 15.1 percent from June 2010, and the figures from France and Germany were down 10.2 percent and 12.3 percent, respectively, underscoring the slow recovery of tourism from these countries.